I had the pleasure to watch him play many times, it feels good for us, tennis lovers, to see one of our own at the Top 100 of the Association of Tennis Professionals. Tennis, unlike football/soccer is an individual sport, you win or lose because of you, no one else is to be blamed and that outlines the nature of a tennis player, which reflects in our daily lives, Kudos to Hugo from Bolivian Thoughts! There are achievements that can redefine the sporting landscape in a country. For small, developing nations, a breakthrough can inspire millions and signal a shift in its sporting culture. Hugo Dellien hopes that this is that moment for his native Bolivia. On Monday, the 25-year-old made a historic Top 100 debut in the ATP Rankings, becoming just the second Bolivian to reach the milestone. Exactly 34 years after Mario Martinez first put the nation on the tennis map, Dellien followed in his countryman’s footsteps. In that span, nine of the 12 South American countries have had a representative in the Top 100. Add Bolivia to the list. Dellien ascended to a career-high No. 100 after reaching the semi-finals of the ATP Challenger Tour event in Tampere, Finland last week. With a population of more than 10 million, Bolivia has a diverse culture rich in cuisine, art, music and dance, with strong influences from its indigenous people. But the nation remains in search of a sporting icon; someone to put the country on the map on a global scale. Now, it has a tennis champion to celebrate. The 5’10” Dellien may be diminutive in size, but he packs a powerful punch on the court. In April, he joined Martinez as the only Bolivians to claim an ATP Challenger Tour title with his victory in Sarasota. Two weeks later, he added a second crown in Savannah and has since notched a third on the red clay of Vicenza, Italy. 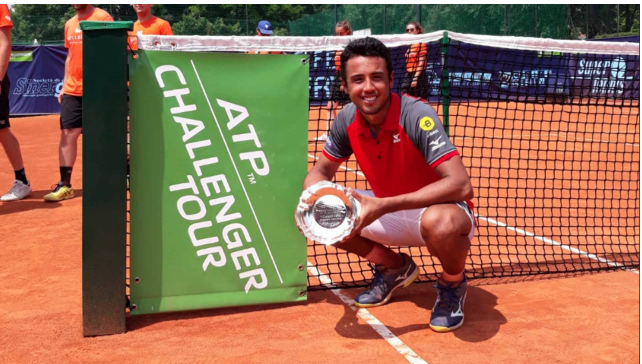 Not only is Dellien the title leader on the Challenger circuit this year, he also owns 30 match wins (second-most on tour).